So here, in their own words, are a collection of stories and advice from loads of families who take their kids out on overnight microadventures. If it inspires you to action, then find out more about Microadventures on Facebook, read the Microadventure FAQ page, or even buy the book. It’s a long piece so put the kettle on first. Then settle down to hear the hard-won advice of a whole range of families who are enjoying spending time together in the outdoors. What are the obstacles in your life that make having microadventures difficult? Tell us about your microadventure with kids. What was good about your microadventure? What went wrong? What would you do differently next time? What kit should all parents put on their Christmas list this year? What packing advice would you give beyond my usual microadventure kit list information? What advice would you give to the parents of children who like the theory of family microadventures but are daunted by the reality? Any books or online resources that you like? How can people who are interested in what you do find out more? Sam Hawkins researcher, (35) Katie Hawkins GP, (34) and Arthur Hawkins (2.5) and as yet unborn baby (7 months.) We live in Edinburgh on the edge of Arthur’s seat. Living in the city makes escaping a bit more difficult. We both dislike the fact that we need to drive for at least one hour to get into the kind of countryside good for microadventures. We arrived at the beach around 6.30, and it was as I remembered. A beautiful stretch of white sand clasped at the end of the headland. It was deserted and we pitched our two man tent on the sand above the high water mark. Arthur shares the excitement of most children about getting into a tent once it’s first up. A dinner of quick cook pasta and sauce, followed by custard, on a small gas stove. Then we collected a good pile of driftwood together, with Arthur clambering about looking for sticks. We watched the sunset, lit the fire, and Katie and I shared the single beer we’d carried in. We tried briefly to put Arthur to sleep in the tent alone, but soon realised, with a small two-person tent, it would be easier to wait a bit and all turn in together. The night was reasonably cramped, and as usual the smallest person ended up taking most of the room, while I rolled downhill into a heap in the bottom of the tent. The next day dawned calm, clear and blue skies. We spent the morning playing on the beach, damming a stream and making pools, paddling in the bracing water, and clambering over rocks. Apart from us, the beach remained deserted. Around 12 we had lunch and walked slowly back. Camping in April means no midges, and it does not get light too early. Camping for just one night means you don’t need too much food, keeps the weight low. Choosing somewhere with a relatively short approach means you can take your time, go at toddler pace, and it’s not too far back if the weather changes or something goes wrong. Don’t set your sites too high. All we had planned after the night camping was to play on the beach and wander back. There was no hurry to pack up, no schedule to keep. Once you slow down to a toddler pace and allow them to lead, life become much simpler and more relaxed. I think eventually we will have to get a bigger tent, once the next baby arrives, as three of us in a two-person tent is getting cramped! Also the balance bike was probably not worth the extra weight, although it did provide some variety and independence. Many people worry about wild camping with kids. Do you have any specific advice on that? Pick the weather window – it need to be fun for them. Camping in the cold and wet is not going to inspire more adventures! Don’t stress about bed times or routines. For one night, it doesn’t matter if they’re up past bedtime playing in the fresh air. Eventually they’ll get tired and fall asleep. Nothing kid specific aside from some nappies, enough clothes to keep them warm, and some decent snacks that they actually enjoy! An decent thermarest/mattress and sleeping bag for them. Plenty of warm clothes for you, so you can go at toddler pace without getting cold. Start small, and work with the weather. Pick a good forecast, and camp somewhere even if it just the back garden, the local woods, or a nice spot just a few hundred metres from the car. Scale your ambitions to the children, it’s for them to enjoy! OS maps! I love browsing OS maps looking for spots which might be suitable. Check them out before if you’re unsure of how suitable they will be. All things considered, we are fairly privileged people with reasonably easy lives. Georgia works in a tough inner city school in Byker and compared to some of those kids our obstacles to Microadventures are puny. It’s not so much about time or money, it’s about state of mind and the confidence to push beyond what you know and that comes from the community and environment that you are born into I think. That said, the obvious obstacle at the moment is our 1 year old ball of chaos, Juno. Georgia signed us up to her ‘˜year of microadventure’ in the months before giving birth in 2015. Who was I to disagree?! I think if it weren’t for Georgia’s stubborn belief that having a kid wouldn’t change anything we wouldn’t have done it. Turns out it does change EVERYTHING! Looking back it’s been a magical way to document Juno’s first year on earth. Thank you Mr Microadventure! One thing they never tell you about becoming a parent is that all of a sudden it becomes so much more difficult to do all the things together that you used to, all the fun stuff that helped you fall in love. It’s easy for it all to be about the kid and you are too tired to actually get out there and live the life that you used to enjoy. The idea of going wild camping when you get little enough sleep in a normal bed is just crazy. The year of microadventures kind of forced us to keep doing the thing we loved. The bonus was Juno didn’t get sick, she didn’t get hurt, she didn’t die, in fact at times she seemed to quite like it. It gave us confidence that we could build this kind of experience into her early years and our parenting. The winter microadventure was a wash out and we called it quits. We knew we wouldn’t end up sleeping out but we did get into the woods and have a fire. There’s a line between pushing boundaries and giving a 1 year old pneumonia! The hardest microadventure was the final summer one. Juno was crawling by this point and we were off in the Northumbrian hills with some good friends The Waits. The camp was about a mile walk from the car so we were fairly isolated(ish). Juno just hated it. We couldn’t relax because she kept crawling off. It was quite cold and she wouldn’t sleep. No I tell a lie, she did fall asleep, at 6 in the morning! We were so aware that our friends were a few meters away in a tent and they were having to put up with baby wailing all night too. We were glad to get home after that one. It was also the last one in the year and to be honest I think the words ‘thank f**k that’s over’ were uttered in the car home. I think the only thing I would do differently would have been to keep the last camp spot a bit easier to bail out of. I know that might seem a bit less adventurous but it was so obvious that Juno was not enjoying it that at times it felt like we were doing it for us and not for her. I think you need to be able to react to the situation – sure push yourself and see what happens but with a kid that young you need to be able to call it a day if needs be. It’s actually easier than you think when they are super tiny – like 0 to 6 months. As long as they are warm, dry and fed they don’t really care where they are. Once they start crawling and becoming more aware of their surroundings I think it gets harder. Not impossible, but have an escape route planned just in case. Georgia made sure to do a series of practice runs in the garden in the weeks before we went out. Not overnight but just to get used to being in a tent. I think this probably helped a lot. She also talked through what we were going to do. I think Juno understood a lot more than we thought. I’mm sure everyone will say this but the all in one romper suit is a must. Not sure about the eco credentials but a campfire is a handy way of getting rid of dirty nappies. My mum and dad never took me camping, they brought me up on culture not wilderness. Actually I tell a lie we did go to France on one of those big glamping tents before glamping was invented. I think they look at me and Georgia with a sense of dread every time we tell them that we’re off into the hills with their precious grand daughter. But at the same time they are blown away at how confident she has become and are the first to hold her up as some little miss golden child at toddler group. I don’t think it’s a coincidence that Juno is growing up to be a confident, inquisitive, brave little girl. How can people who are interested find out more? Jon and Jaime Stiansen ages 41 and 42. Jon is a therapist with a full time job and contract work and Jaime owns a small business as a health coach. I have three kids ages 11, 8, and 6. My husband and I love the outdoors and when we had kids we never stopped camping. My eldests’ first camping trip was when he was 6 weeks old (it was a nightmare). He had colic and cried all night- we had many nights like this as a young family with all of our kids close together. It’s highly competitive to get campsites in Southern California without a ton of planning. Aside from that¦ time, money and commitments to sports for kids. When the kids were smaller life just felt like a hot mess with them so there is an allure to just stay in your ‘˜comfort zone’. But we always figured if life was going to be hard, why not have it be outside in the fresh air where we can get good walks or climbing in?! We decided to camp at the yellow post sites around the corner from the house. We ate dinner at home quickly and jaunted out to the forest. Sometimes we do tailgate dinners and climbing on the weeknights. It’s harder to find families that are interested in joining us, but we still try! Another time we decided to go to Joshua Tree National Park- which is 2 hours away. We had a 24 hour turn around just after the holidays- we have done this a few times. However when my kids were smaller we would just go on ‘˜child led’ walks for an hour or so. When my kids were smaller, our adventures were walking around the neighborhood without an agenda to see signs of spring, or climb giant snow berms. I feel like those moments have shaped my children into the adventurers that they are today. They had time without my expectations on them, time to observe and to play! Not many kids get that nowadays with the highly scheduled American life and two working parents most of the time. Freedom! It was just great to leave and be free with the kids. We get so wrapped up in the day-to-day of life. The routine of cook, clean, rinse, repeat. As a mother- I feel like I ‘˜make fun happen’ but when we’re camping I get time to wind down and put my to-do list and laundry aside and just ‘˜be in the moment’. I basically ask that question every time we go, what would I do differently next time? No matter where you are- you have meltdowns, potty accidents ‘¦.we used to have an underwear tree when we were potty training the kids in the outdoors. It’s always something! A lot of it had to do with my attitude when my kids were younger. Just packing for things pushes you to your mental limit. Sometimes kids would be sick or up all night while camping. I think it is imperative that we take care of ourselves as adults so we can survive trips in the outdoors with kids. When you camp with kids- especially at the beginning- it always feels a bit epic. Really I think people who camp with families deserve to be recognised as much as world class alpinists’¦ you have to keep your cool (which doesn’t always happen), pack for not just yourself but this crew of little people’¦.and have unending stamina since kids will go to bed late and wake up at the crack of dawn. You really have to ‘˜take care of yourself’ as a parent. All that to say, every trip is a refining tool for the next one. When the kids are young, everything could go better really. I used make lists and debrief every trip on my way home. Also I would look at it as an investment. You might not get a ‘˜return’ on your investment right away, but in the long- term the outdoors teaches so many lessons. It brings to the surface and facilitates things in all of us that we have to look at- when we go on hikes and kids whine- that’s an opportunity to love your child through that moment and also to allow your child to push themselves and accomplish something great. I would always say: the simpler the better. I think packing takes as long as you have. If you have 4 hours- it will take 4 hours. If you have an hour- it takes an hour! I break down packing into 1. Eat 2. Sleep 3. Poop. If I have those bases covered then everything else is icing on the cake. Also teach them how to help you and remember when they are small that it is just a season and you are helping to form little outdoors people. I really like the modular hauler for my family http://www.sierratradingpost.com/mountainsmith-modular-hauler-4~p~73728/?utm_source=GooglePLAs&utm_medium=PaidShopping&utm_term=Mountainsmith_Modular_Hauler_4&utm_campaign=PCGOOGLES7&currency=USD&codes-processed=true. I have four of them. Each of them are labeled and I used to have one hauler for each kid and then realised for every ‘˜event’, meaning bedtime, swim, cooler temps, etc, I was getting into each bag for each child. So now I have each bag labeled with duct tape: all swim, warm layers and beanies go in red. Then all pajamas go in blue, we keep basic clothing in another color. We use this for ski gear as well. We’re not super organised people and three kids didn’t really help that situation but we are able to rally because of tools like that! Also- as soon as your kid can understand you- put them to work. Now I can give them a list and they just get it done, but before- one item at a time I would send them back to get it out of their room. Again- this is looking at the outdoors as an opportunity to teach and invest. ‘œGo get one pair of pjs, three pairs of socks, hiking shoes’¦’ one command at a time. Also we ask our kids to unpack. It is a principal that my kids understand that the workload needs to be spread out among family members so that we get to go more often. If it’s just mom and dad making it happen- well- it’s a ton of work for us so the kids know that it takes hard work to have fun. The older ones get this, my 6 year old is just learning it still but its been a lot of years of working on it. For packing: I always keep my camping bin stocked. So at the end of the trip I take inventory of what needs to be replaced and try to replace it so the next time I don’t have to run around all crazy buying stuff. I have a cooking bin ready to go in my shed. It has it’s own olive oil, utensils, plates, fuel, TP, extra ziplock bags, camp soap, trash bags, cook pots and griddle. In my house is my ‘˜lantern kit’ this has lighters, first aid supplies, headlamps, lanterns, camp toothbrushes, paste, hand sanitizer and toothpaste. I don’t have an RV but I try to live like I do. So I have separate cooking pots for camping so I don’t have to repack all that stuff. We packed for a last minute camping trip in about an hour and a half. When we go we have to put sleeping bags in their stuff sacks (we leave them out so the loft stays nice), pack food and clothes and that’s about it. Honestly- with anything- even just a hike with kids, I would encourage parents to have low expectations- it is an opportunity to see the world through the eyes of someone who is forming and growing and maturing. What an amazing gift- to expose a person to new places and things. One of our micro adventures we ate at home and just left after or on the road and that was one of my favorite ones because cooking and thinking about food always feels kind of like a headache. This is why I think the simpler the better and having an arsenal of easy meals that you can make is the key to success. Granola, oatmeal, or eggs in the morning, quesadillas for dinner, snacky foods at lunch. Carli Summer – Mum of Solomon age 11 and Otis age 9. We live in Hayle, Cornwall. A Husband that works abroad often plus our small terraced house is sandwiched between a very busy road and a housing estate with a small garden. My boys love camping out and have always wanted a den of their own. Unfortunately our house is not surrounded by countryside and our garden is the size of a postage stamp so my husband came up with the genius idea of building them a den in the garage where they can hang out and also sleep the night. My sons felt like it was a real adventure fitting out the den with all their camping gear like sleeping bags, pillows, torches and special twinkly lights. They are only sleeping three meters away from their own bedroom but they absolutely love this little bit of excitement and independence. Long lengths of rope in various colours and thickness plus a book of knots- the Prusik knot is a brilliant knot for kids to learn, it’s a slide and grip knot which is great climbing up and down trees. It’s not always as hard as you think it’s going to be and you never end up needing all of the tons of stuff you’ve squeezed in the boot of the car. Most kids are capable of much more than we parents realise because they are so rarely outside of their comfort zones. We all want to keep our kids safe but adventure alongside a little calculated risk lights them up. I have noticed that when we go on an adventure my kids seem more contented and chirpy for days, sometimes even weeks after and nothing makes me happier than hearing them regale their mates with stories of their expeditions. Let them test out their own limits and capabilities, even if it means two or three nights of broken, restless sleep for the parents (I can’t sleep a wink in a tent!). Wendy Searle, 39, Alice Searle, 12 and Sam Searle, 8. We live in Salisbury, Wiltshire. We have four children and we both work full time. Finding time and brain space to go out, even overnight, can be very challenging. One great microadventure last year, we went to the playing field about 800m from our house. A meteor shower was forecast. We took a highly-visible pop up tent but no one asked us about it as we didn’t see another soul. We’d brought all the camping gear, plus lots of woollen blankets (the scratchy ones which are actually warm). Being so close to home meant bringing loads of gear wasn’t a problem. The 8-year-old climbed into his sleeping bag while my 12-year-old and I wrapped ourselves in said scratchy blankets and watched the meteor shower and talked about life, the universe and everything. It was magical. Never share a sleeping bag with your child, no matter how small. They wriggle. All. Night. Long. I’mve never had an issue. Having your children with you also makes you less threatening than a single person -people often think ‘˜what harm can it do?’ when you have children with you. You rarely see anyone apart from keen dog walkers after about 7pm anyway. Sweets and treats always help! Any food tastes good outdoors – we’ve used Expedition Foods dehydrated rations for the full wild experience, but if you’re near a village, a warm pub is welcome! Giving children their own head torches, and jobs to do (setting out the tent, lighting the fire) makes them feel part of it. Favourite books read in the tent are hard to beat. I always forget to bring money (this is the wild, right?) but there’s invariably a shop for ice cream/ a chip shop en route so bring cash. I’m™d like to invest in better roll mats this year. And a bigger rucksack so I can carry more of the kids gear when they get tired. Start small – go somewhere so close you could easily walk/drive home if you’ve had enough. Maybe even plan not to camp out the first time but set up the tent, eat your wild supper, and then sleep at home. Or try a micro-adventure in the garden so you can be sure you have everything you need when you’re further from home. My biggest obstacle is workload – typically 60+ hours/week. We are very normal folk – my love of the outdoors grew from my time in the Scouts many years back. My first misadventure with kids was the Dad and Lad midsummer adventure on Dartmoor, June 21, 2014. The following years, my wife and daughter came along with us, again on Dartmoor. To me, the outdoors is a little like a teenage crush: you want to spend all your time there, but can’t and you think about it a lot when you should be concentrating on other things. Microadventures are a way of keeping things under control. Of satiating the desire, while still maintaining a ‘normal’ life. Most kids love the adventure of sleeping outdoors if they feel safe. Get them to sleep alongside Mum/Dad so they feel safe. Feed them biscuits for breakfast. Get them to sleep in their clothes so they don’t get cold at night. Go local when the weather forecast is reasonable. Remember – they will love it. Get them to carry a little backpack so they feel like an adventurer. Print a map for them to follow and make up a treasure hunt for them to follow: find an interesting stone, a flagpole, a warning sign. A Thermarest NeoAir xTherm pad – a great night’s sleep will follow. Alternately a buff to use as a blind-fold, a head-torch and a hip-flask. Sleeping out in the back garden is a good first step to gain a little confidence that everything will be OK. Assuming this goes OK, then staying local and camping somewhere close the car (i.e. within walking distance) is a good next step. This way if something goes wrong you can always get back to the car and staying local avoids the long haul home. Spending time outdoors does develop skills that are useful, learning to ‘œgo’ outdoors, digging a 6″ cat-hole to do your stuff in, is a great life-skill that could be useful any time. Dealing with a little adversity and getting covered in sweat and mud is good for the soul and helps put life into perspective. (Very) occasionally, I write about outing on my blog at moorishmicroadventure.wordpress.com. I’mm planning on taking the wee ones out for trips within the next couple of months, but will be waiting until the overnight temps are a little higher. My name is Gavin Longley (38), I have three daughters, Olivia (10), Isobel (8) and Lucy (6). I work as an Operations/Contracts Manager in heavy industry, ports, steelworks, power stations etc. but I also run a small trail running events company called Urban Trail Runner. We live in Leeds. The biggest obstacle is definitely time. With kids involved in clubs at weekends, either football, gymnastics etc. I find it really difficult to find a free weekend when we can escape on a Microadventure. But last summer, I came up with what I think is the perfect way of having a microadventure with kids, and here it is’¦..
We headed up to the Lake District in the afternoon after the morning clubs were out of the way. We hiked halfway up Great Gable and camped overnight at Styhead Tarm. In the morning we hiked to the top of Great Gable, then back down to collect the camping gear, then back to the car. We stopped at the pub on the way back for chips, pop and ice cream! Splitting the climb into 2 x uphill sections made climbing a mountain more easily achievable for the kids and less of a slog. Also, one afternoon and one morning’™s worth of food/water is just about enough to carry for me. It cost nothing, I’mm lucky enough to have an expensed company car, otherwise fuel would be the big expense in this case. I treat them in the pub afterwards as I think it’s important to reward their efforts and for them to have go back with great memories, but you don’t have to do this. 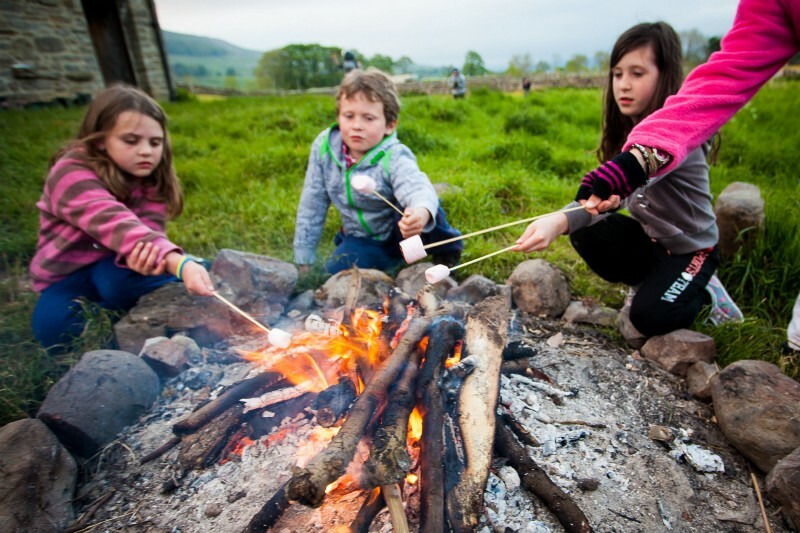 The kids absolutely loved everything about the little expedition, especially camping wild next to the tarn. We did Helvellyn the same way a couple of weeks later. I put wasabi sauce on the noodles by mistake, making them inedible for the kids. We’ve wild camped all over the place, beaches, forests, mountains etc. What packing advice would you give beyond my usual microadventure kit list information? I find wellies are the footwear, whatever time of year, just because they love to go exploring in stream, all the time. Always take little treats to reward efforts. But it’s pointless spending lots on kids outdoor kit as they grow so quick. Just a reasonable waterproof and wetlegs. Hats/gloves. Always take warm stuff whatever the weather. I’mve bought all mine penknives as well, which some may think irresponsible, but I rather think it’s giving them more responsibility which they respond to positively. Headtorches. I bought each of my girls a copy of this book http://www.thegutsygirl.net/which they absolutely love and is full of cool, inspirational ideas for them to do outdoors. I get truck tyre inner tubes free from work and these make the perfect boats/rafts for kids.But the best things you can give your kids are time and freedom. Sports clubs are good, but kids who get told what to do all the time grow up to not been able to think for themselves. First just try camping on a normal campsite, but think about how you would do it in the wild, then try doing it wild. If walking with kids, try to pick routes with interesting features along the way, e.g. streams to cross, rocky outcrops to climb, little caves to explore etc. Just a long walk doesn’t do it for kids. Don’t pay too much attention to the weather forecast or you’ll never do anything. A big inspiration for me is a book by Jay Griffiths called Kith, which compares why kids in poorer countries who have nothing, seem to be happier than our kids, who in comparison have everything, and it comes down to levels of freedom. The media in the UK have shocked parents in this country into really restricting the freedom of our kids. Another fantastic book for kids is Bear Grylls Survival Stories, these are lots of fascinating short survival stories (perfect bedtime story material) to set their imaginations on fire! Long working hours, long commute into the city, lack of sleep due to young baby. I’m™m not sure if this counts as a micro-adventure as there was no bivvying nor was it truly micro, but when Emma was 10 months we took her around New Zealand for a month with just an old hire car, a secondhand tent and one suitcase between us. The baby was surprisingly resilient when we didn’t have a bath, she was quite happy splashing around in a sink or being washed with wet wipes, and the outdoors offered far more sources of entertainment than the few toys we had brought along. We used a mixture of wild camps, commercial campsites and the occasional AirBnB or friends’ spare rooms but the vast majority of nights were under canvas. Discovering our tent wasn’t waterproof! We managed to move it under a nearby shelter for the night, then resorted to AirBnB whenever it looked like bad weather for the remainder of the trip. Plan a meal you can cook/heat up in one pot, take plenty of warm clothes and make sure you get there while it’s still light so you’ve plenty of time to let them explore while you set up camp. We love the pop-up camping cots for small kids as they’re quick to set up and pack away. A fabric highchair is also great for restraining a wriggling toddler in a camp chair at meal times and packs away into a tiny pocket when not in use. A soft carrier is essential for small ones. You don’t need to be far from home to wild camp, just somewhere away from electricity and the comforts of a warm bed. Any local field, woodland or basic campsite will do, even a neighbour’s garden! With the extra kit needed for children, we like being able to set up camp near the car. It’ll still be an adventure for little ones, and you can retreat if the heavens open unexpectedly. We took Emma on a few overnight trips to local campsites before the big one to test the kit and build our confidence. Duncan Gray. 46, father of four (9, 13, 16 and 19 year olds). We live in the Chilterns. Very fortunate to currently live on our in-laws farm. After 30 years of long hours in butchery I am now self-employed. Most of my time is focussed on building up a not for profit Care Farming business on the family farm. Problem for me over the years has been silly long hours, over 6-day weeks and fitting in all the things the children have been involved in outside school alongside my own commitments. Time to fit them in is still a juggle but not as tight. A lack of unspoken for money means it has to be as low cost as possible, though the necessary simplicity this requires seems in part to be adding to the fun. Nearly all our microadventures are very local. If they include a night sleeping out that can be sleeping bags under a tarp or in a cheap(ish) bivvi bag. My eldest two have always been keen on camping hammocks and now have one each. We have slept at the edge of fields, in the middle of a field, in small patches of woodland and even in the garden! We have had some really great nights just in the garden! I always try and include making a hot drink or cooking something, however simple. One of our most enjoyable was possibly the simplest. My sons got up very early and walked to a local monument. I followed later and parked nearby with the girls and walked the last bit in. We were all there to see the sunrise and sing happy birthday to the eldest. The decision to do this was made at 7:30 the evening before. Getting wet! We normally pick dry nights to sleep out. On one occasion it was due to have some ‘˜light rain’ and I thought we’d be fine with a tarp laid over the top of myself and youngest sons sleeping bags. I hadn’t allowed for how much a young lad can wriggle in his sleep! By 01:30 in the morning I was decidedly damp. Fortunately we could retreat to my sister’s house and spent the rest of the night on her floor. It was still great fun and something he remembers. I always string the tarp up properly now if there is any chance it could be needed. If the night starts clear and we can see the stars we can stay in the open, if it starts to rain we can retreat under it. I’mve also gradually bought a couple of decent bivvi bags. Start with somewhere they and you know. That might mean going out before hand and walking (exploring!) the area together. Be the advance reconnaissance expedition! Find recordings of the various animals and birds you might hear at night. Foxes, muntjac, squabbling badgers, frightened rabbits and owls can all make some seriously weird noises in the small hours. It is all a lot less frightening if you can name the noise, even make a story between you of what might be going on. Silly voices and daft imagination can be invaluable, you wouldn’t believe the ‘˜conversations’ some of the wildlife we’ve heard have been having ! Be prepared to sit up all night and quietly natter if necessary. Have a warm, comforting, snugly sleeping set up. If they aren’t familiar with sleeping mats, bags or having a hat on in bed perhaps have a practice ‘œwindows open camp in’. Oh, if you can, get a torch with a red or green light to it. These are far less stark and garish than a white light if you do need to see ‘œwhat’s that noise’. I’mve found a glowstick tucked in close by can help too, just enough light to know they can find their torch or see you if they need to. Bedding is best warm, snugly and familiar. My daughters take their fleece dressing gowns and normal pillows. The boys now have their kit they are used to. A flask, to have either a hot drink made up or the water to do one through the night if needed. Glowsticks, little ones, are very handy for marking where shoes, torch, parent etc. are if needed. Where possible have things that are a good size for them, waking curled up at the bottom of a six foot sleeping bag unable to get out can be frightening. Extra socks and spare warm hats/gloves. Acceptably good gear and clothing doesn’t have to be expensive, watch the value stores like Aldi etc or sale sites online. Take a torch with a red or green light, they don’t night blind you as much and create less scary shadows. Try to avoid too bright a torch, they can at times be less helpful (and draw a lot of attention). – A ‘œSwiss army volcano stove’! Brilliantly simple, very effective, relatively inexpensive. Good for learning to light, feed and manage fires. Great for hot drinks and cooking noodles, pasta, soup and such in. -Bivvi bags. Even after a dry clear night you can wake up sodden with dew. Waking up with your bivi bag covered in glistening pearls of dew is something altogether more special. Small and simple, don’t over plan it. Although sleeping out is fantastic, you do not have to start with that. I’md suggest sunrises and sunsets as a good entry point and something that can be done with minimal pre planning. Get up early and walk/cycle in to your chosen viewpoint, it doesn’t have to be a long walk. Warm clothes and a blanket to wrap up together in. Flasks of hot chocolate, pre-made bacon sandwiches or a little gas stove to cook some on. Same can be done at sunset, get to your view point in time with hot drinks or simple food and enjoy the view. Walk back in the dark. Gauge it just enough to feel like a challenge but still be loads of fun and very achievable. Do what works for you. If that means carrying a briefcase style canister stove and a frying pan from your kitchen to cook breakfast on that’s fine! I am a pretty skint but happy single mum of 3 girls. We are often asked about safety as we are all females camping in the sticks. We have very basic kit so we like microadventures because it is free and you don’t need any stuff! Also can’t afford a ‘˜proper adventures’ abroad so this boosts our confidence and makes us feel that we have a life! Being too tired can be an issue, a long week of work and kids on my own all of the time can mean that I need a real kick up the bum to get going! We have decided to microadventure once every month throughout the year. Jan=woods in biblical rain with mates, Feb=Dark spooky woods me and Sunny [daughter aged 13] in orange survival bags on a school night, Mar=Field next to the Camel Estuary with mates, Apr=School field with 17 year 3 kids I was in in a hammock. We always feel as if we have had a much bigger trip and adventure than we actually have. It never needs much planning, we just do it. Even in dodgy weather we still go and still love it. Whatever happens it’s o.k. as it’s only one night. We overcome fears and anxieties about things like the deep dark woods. The first time in January we were going to use a tent for some of us as it was cold and super wet, we forgot the tent poles so used the tent as a ground sheet and slept under a tarp and were actually fine. I think that’s the point, it’s one night, it doesn’t matter what goes wrong. Be subtle about where you choose. I make sure that we are not drawing any attention to ourselves when we arrive. I usually don’t even park anywhere near where we are sleeping so as not to arouse any interest or nosey-ness! Don’t take much kit it will look like you are just on a walk. Make sure you have mobile signal. You may be nervous but act like you’re not and in the morning everyone feels like a million dollars for having done it. Lots of layers of clothing makes up for expensive sleeping bags. I made a fleece liner for my kids, just a sewn rectangle of fleece material. Kids are often oblivious to the things we worry about or care about. My kids sleep through any temperatures when I might be awake all night with cold feet! I do have a jetboil which packs up really small to a similar size to a travel mug, we all have a hot drink and maybe some porridge just from hot water, it forms a part of what we enjoy. We use a kelly kettle depending where we are. Get the kids, no matter how young, to carry some of their kit. A kelly kettle is great but practice using it first without your kids. A jetboil or similar is pretty useful easy and light. Make a fleece sleeping bag liner, you can choose from lots of funky patterns to suit everyone. A little fire bag with kindling, fire steel and cotton wool is cool. A good light tarp and bits of string. We use a dry rucksack bag for some of our stuff that is better if it doesn’t get wet or damp overnight. I would ask them to come with us on a fair weather day and time of the year, provide them with things they don’t have to take all of the barriers away. I would also take their kids with us if they were not up for it and let the kids use pester power when they get back! Offer to go camping with them but then camp out without a tent, use a bivvi or hammock instead. I think some people need to see it to believe it. I am Joel, married to Linsay with 4 children in tow. Jack, 8, Beth, 7, Luke, 3 and Finn,1. We live in Cyprus where we work as full time teachers. Our biggest obstacle is time, we work long hours and kids clubs etc reduce free time even further. This is closely followed by doing something which is practical and appeals to all 4 kids. The weather can limit things in the summer as well to a degree as can carrying enough ‘˜kit’™ associated with young kids but like all barriers, they are simply obstacles to overcome and the truth is you just need to get up and crack on. It’™s rare there is no solution. One of our favourite microadventures was a New Year’s Day dip and dinner on the beach cooked of course over a campfire. Admittedly this is Cyprus but the sea still takes your breath at that time of year. While it was a bright day the air was cold and after a ‘˜refreshing’™ swim and toe dip for the youngest (he was 4 months at the time) we dried off, dressed and built a fire for hotdogs cooked in the can for dinner. We loved getting out on one of those days when people seem to often sit in. The beach is ten minutes walk from our home and is often packed, yet we were the only ones there that day. The vitality we felt from the swim was huge and made us appreciate our clothes and food much more. The kids loved finding the wood to burn and building the fire, and of course they were delighted to have hotdogs for dinner. There were no problems as such, we could have extended it to last longer than the couple of hours but we were all happy so who cares?! Apart from the usual baby paraphernalia, towels and wool hats etc I took a lighter with cotton wool dipped in vaseline for Jack to start the fire. The kids think the most important thing to take that day was the ketchup for the hotdogs. Our kids love the ‘˜flint and steel’ which was a recent pressy. They also love welly socks too, and it makes sense because we all know how cold feet can ruin a day out. To those unsure, start small, get a flask of hot chocolate and biscuit and go build a den in a wood to enjoy it in. Scramble up a steep hill in a bid to plant a victory flag. Or get geocaching in an area new to you. Most importantly, keep it simple and make it fun. Dragging a reluctant walker 4 miles without reason is pointless, going hunting for ‘˜snakes’ or a ‘˜gruffalo’ is much more exciting and the miles fly by. Make the most of the opportunity to talk to your children without distractions and embrace the great outdoors. The key to me is ‘˜imagination’ and kids have this in abundance, begin by making it exciting for them and before long they will be making their own adventures and showing you what a really good imagination can do! Over the years we’ve often used places such as national trust sites, forestry commission areas, national parks etc. Seth Flanigan, age 36, project manager for the Bureau of Land Management USDOI, Boise Idaho. Only have one night a week available ‘¦ kids aged 8, 6, and 5 months. Quick backpacking or camping trips, mostly. If we are able to find some time off from school and work, we will take longer camping, river, or backpacking trips. For the past couple years we have been able to get away for a one or two night backpacking trip with the two older kids. We usually don’t cover very many miles, but just try to get away from the road and preferably near some water for fishing and swimming. It is refreshing as a family to get out of our normal routine, or any routine for that matter. A quick break allows us to be a little more creative with our time. It also gives our kids some opportunity to accomplish things for themselves ‘¦ hiking miles, carrying packs, setting up camp, cooking dinner, building forts, and letting their imagination run wild. It is a wonderful bonding time for our family. Once had wolves wake us up in the middle of the night ‘¦ was really only worried because we had brought our dog along. He stayed quiet and there was no real incident or problem. Once we got chased out by smoke from a nearby forest fire. Better planning would have saved us there. Wild camping is the best camping. When the only hazards are the natural kind, we feel more comfortable letting our kids roam a bit (so long as they are within eye and ear-shot). When we get to any area, we usually discuss the hazards and explain how to avoid them ‘¦ swift water along rivers, snakes in rocky areas, poisonous plants, insects, etc. We also point out ‘œsafe areas’ and allow kids to explore within those parameters. We are able to relax while still being watchful. Allowing such exploration provides opportunities for the kids to show their own responsibility and resourcefulness. Plenty of snacks and treats, especially if your microadventure includes hiking. Also, some sort of comfort companion like a plush toy or even a blanket. I got these tips from TheBigOutside.com. We got our kids backpacks with decent support and capacity. They have doubled as school bags as well for the last 2 years. Micro adventures have been lifesaving during the summer for our sanity. Getting the kids away from the house and any potential boredom gives us, especially my wife who is at home with them, something to look forward to all week. Again, this gets us all out of our routine and provides experiences our kids can thrive off of all year long. Microadventures during the school year do the same for us, but on a shorter scale. I have seen my kids grow and experience success more often on these trips than I would if we stayed home and stuck with our normal everyday activities. The trips, to our family, are priceless and memory filled. No one remembers what they did last week in school, but they remember every detail of our backpacking trip two years ago. I found a lot of inspiration and information at TheBigOutside.com. The Author has taken his kids on adventures, big and small, across the world and gives a lot of good advice and secrets of success. We’re a recently-family-of-three: James (35), Trish (27), and baby Atlas (3 months). We recently moved back from Melbourne, Australia and now live in Northampton. James works a few shifts in a local coffee shop and Trish is just starting back at work full time, selling wine. Our son, Atlas, is very young – only three months!! Trish is working full time and studying on the side and James works weekends. We need to be around for Trish’s Dad, who lives nearby. So time to have microadventures is precious. We took Atlas to the Peak District in early March when he was six weeks old! We did a seven mile loop from Castleton, taking in Mam Tor and Loose Hill. Even the car journey was an adventure as it was the furthest he’d ever been away from home! Trish carried him round in a hiking front-carrier. We celebrated in Castleton with a very welcome beer! It felt liberating – after a rough first six weeks of baby vortex and sleep deprivation it felt like a huge achievement to not only do the walk but enjoy it so much. We were feeling more confident as parents by the time we descended off Loose Hill. The time together as a family. Being close to us, gently rocked, and outside, Atlas slept soundly the whole way round. We got more time to chat to each other than we had since he was born! Not much! In getting the rest of us out the door successfully, James forgot his boots and had to walk it in trainers. There’s so much to think about a list of essential reminders wouldn’t go amiss! Babies are super portable and need much less stuff than you imagine. A comfortable baby-carrier. Make sure you get one that is hip-healthy. Lots of the high street and budget options aren’™t. As long as you’ve thought about what you’re likely to encounter and planned accordingly, there is very little that you can’t deal with when faced with it in the moment. The more that happens the more confident you’ll get. And if you’re relaxed, your kids will be to. So you can all have fun. Ross Christie, 30, Visitor Centre Manager, West Linton/Scottish Borders. Euna Christie, 3, at nursery, likes My Little Pony, pancakes and her purple sleeping bag. I have a Full time job with a long commute and a three year old which make large scale adventuring difficult but short trips and microadventures are a great way for my daughter and I to spend time together and for me to introduce her to the outdoors in small doses. We have been wild camping a few times in the Cairngorms and Loch Lomond and Trossachs National Parks. Our most recent trip was a bikepacking adventure with Euna in a trailer. After a long cycle we pitched our tent in one of the new wild camp authorised pitches in the Loch Lomond NP near Loch Drunkie close to our car and a public toilet block so we weren’t far from anything we might need. We played in the river near our tent building dams, looking for minnows and splashing each other with water before taking a quick ride down to the nearest pub to (unsuccessfully) hunt for marshmallows for our campfire, we did however manage to find lollipops for her and beer for me. We headed back to our tent and read a few books together by the fire before Euna fell asleep, I wasn’t far behind! The next morning was cool and cloudy and we opened the tent door and stayed in our sleeping bags for a while watching the sky brighten up and listening to all the different sounds we could hear before packing up and heading home in time for breakfast and the rest of the weekend! Euna had a great time helping to pitch the tent, building a fire and cooking on the camping stove. We watched the moon come out while the sky was still blue and then saw the sunset and the stars come out, she was in her sleeping bag in the tent with the door open while I sat outside and kept an eye on the fire. The best thing about these microadventures is the time we spend together just the two of us. I love the outdoors and spend a lot of my free time trail running, hiking, cycling and camping and I want to pass on these things to her too. Euna was cosy in her sleeping bag but really cold when we had to get up in the morning – lots of extra warm clothing layers are a must for next time! The first few times we tried microadventures I was really trying to fit a lot of experiences into our trips (walking, cycling, finding insects, treasure hunts etc) but got too stressed out trying to do everything. I learned not to force or plan these experiences too much and let things happen naturally. If you find a great spot for creepy crawly hunting or river paddling then great but don’t get too worried about missing out on something – your wee ones won’t know the difference and will just enjoy spending time with you in the outdoors. There are always more opportunities to have new experiences in the future. We’ve been wild camping a few times and have learned a lot along the way. I always make sure I bring lots of things for Euna to do – books to read, stickers books and puzzles to play with and even a few back up bedtime stories downloaded onto my phone. It may not be the ideal escape from the digital, connected world but sometimes you need a few home comforts, especially when the weather is bad and you can’t play outside! Before we went for our first wild camp Euna tried her sleeping bag and mat a few times in her room. This was great as she got comfortable with the idea of sleeping with them before going out into the wild. I always make sure to tell Euna what our plan is for every adventure and keep her updated as we do thing (e.g. We’re going to drive for a while, then cycle, then we’ll have some lunch, cycle some more and the we’ll go camping) it helps her feel more in control and know what’s coming next. I’m™m always sure to bring plenty of baby wipes for accidents, muddy playing and food covered faces. I also try and get Euna the same gear that I have – she has her own compass, binoculars, maps etc. She might not know exactly how to use them yet but it’s a fun experience for her to try and do the same things as me when we’re out and about. You also can’t take enough snacks for a child in the outdoors’Š’”’ŠI bring as many as possible and a wide variety of options from bananas and grapes to rice cakes, crisps and the occasional chocolate. It’s tiring work and they need the energy! I’md go for some easy to read guide books about mushrooms and fungus, wild birds, trees, animals and flowers. We’ve spent so much time sitting by the campfire or even at home after an adventure looking at things we’ve seen and things we might see in the future. I also really like a small set of battery powered fairy lights to hang around the closest tree or next to your sleeping bag – it gives some extra comfort if it’s really dark (which can be a bit of a shock for a child used to the city lights!) and adds some extra magic to any kids campsite! Take things one step at a time. Try a small ‘œcamp’ it the house first with some sleeping bags and a makeshift tent in the living room, progress to the garden or a campsite with food facilities before going fully wild! I’md also recommend finding some kids books about camping and the outdoors to start reading before you go or even watching some tv shows where the characters go camping to get them used to and excited about the idea of sleeping outside. It sounds a bit cliched but I’md also say don’t force anything if you’re child isn’t ready for it, the worst thing you can do is put them off this sort of thing for life! Just take it one step at a time and enjoy each stage of the process, it’s about spending time together and it’ll be great wherever you are. I’mm on Instagram as the_trail_journal and I also have a blog under the same name: www.thetrailjournal.com where I share a few of our adventures together. I’mm a big fan of the @anoutdoorsfamily page on Facebook, they have some great advice about adventuring with kids and a lot of inspiration for different things to do in the outdoors with a young family. Ben Garbutt (41, charity fundraiser), Jenny Garbutt (38, primary school teacher) Sammy Garbutt (6), Louie Garbutt (3), Ella Garbutt (10 months). We live in Abingdon, Oxfordshire. If we wanted it to, we would think that having three small children in itself would make having a microadventure difficult. We live a two hour drive from the nearest national park. We have busy, demanding (and not hugely well paid) jobs, so finding time and buying expensive kit is usually out of the question. But, we also make time to get our kids excited about outdoor discovery so that they are motivated to get out, and we have wonderful scenery and pockets of wilderness on our doorstep that don’t require a fortune to access. Together with the kids, we planned an ‘œAdventure Weekend.’ With three small children of different ages we opted for a sleep out (in the back garden, in a tent or under the stars according to preference), an outdoor climbing wall excursion including a long woodland walk and some low-rope monkeying around, and some geocaching. It offered variety and adventure in equal parts. The activities we planned each could be adapted for different ages, and all had a ready made Plan B. The sleep out was always going to work (add some marshmallow toasting and you’re guaranteed enthusiasm) but the geocaching was an unexpected hit’Š’”’Šall you are really doing is going for a walk in the countryside, but the introduction of a target to aim for and an electronic device (I know’¦) made it more exciting for everyone. With both the climbing wall and the sleep out, Plan B was easy’Š’”’Šeither head inside to your bed, or take some time to watch the other climbers with a hot chocolate. After a sleep out, tired kids don’t necessarily make for compliant kids. If they need it, give them some down time too. Warm clothing for the kids, and treats for bribery if/when something is a little too much for them! Get a tick list of achievable ‘œchallenges’’Š’”’Šour kids go absolutely nuts for it! Go microadventuring yourself without them. This seems contradictory, but when they see your enthusiasm and hear your stories, they’re going to beg you to take you with them. ‘œWhy can’t I do that?’ Well, you can. Start small and don’t push beyond their boundaries. There’s no point trying to drag a recalcitrant 3 year old up Snowdon. Conversely if you find something they will do, a bite-sized positive taste will have them begging for more. Babies up until about 18 months to 2 years are surprisingly portable for long hikes. Take advantage of that since the years between 2 and ish are those when vocal disinterest can be more easily registered! Justin Featherstone, 47, leadership consultant and expedition leader. I live in Devon and have a 9 year-old daughter called Oake, who lives in London. Lack of routine; unpredictable work as a freelancer; majority of my year spent working away from home and much of this overseas; and my daughter lives with her Mum in London while I live in Devon. Our adventures started when she was 5 and have included bivouacking on Dartmoor and wild swimming; canoe camping on the Exeter Ship Canal and Dart estuary; mini-beast hunts; rock climbing and cycling adventures. One of our first micro adventures was a bivouac at Shilley Pool, near Throwleigh on Northeast Dartmoor, when Oake was 6. We left the car for the short walk later on in the afternoon to ensure that it was deserted and felt truly wild for Oake as she set off on her first bivouac. We quickly put up the bivvy tarp across 2 trekking poles before going for a swim in the pool as the sun went down. Oak had chosen the menu’Š’”’Šsoup and pasta carbonara, and she helped cook. After we had eaten, we told stories and played Story Cubes before going on a midnight bug hunt and walk by moonlight. The views are breathtaking and the setting truly wild and special. The weather was very kind and the location is idyllic. Nothing I can think of. I brought a tent in case she wanted it but she turned it down when I offered it to her. None other than don’t! Children are far more robust and naturally adventurous than we are. They are also very responsible when given responsibility. I bought my daughter her first pen knife last year and she always sticks to the rules we agreed on for its use. Plan well and choose an inspiring and magical setting. Never underestimate how much warm gear you may need to bring, as children cool very quickly and especially when tired. I always bring ‘˜Story Cube’ for children and adults alike. Paper and pencils are essential and I often bring a loupe to inspect ‘˜mini-beats’™. I always think of special activities such as moonlight navigation on pinpoints on card or bearings only; treasure hunts; shelter building, making art from nature or making our own maps of our location. I always bring a frisbee too. If we are near water, I bring Oake’™s shortie wetsuit as she feels the cold far more than I! Finally, you can never have enough snacks, which I get Oake to choose. Matchless fire starting kit, ‘˜Story Cubes’™, a firebox for camp cooking and a loupe or magnifying glass. Think of a location you would personally love to wake up in and initially not too far a walk from your drop-off (under 30 minutes for your first such adventure). Keep it simple and think what you will do there – what do your children love to do? Camping by water in which you can swim has a special quality and let the children choose the menu and help you with the shopping. Recce the area or even the site itself with a family walk a few days or weeks before your adventure, so it has some familiarity. Have a backup plan, such as a tent for really bad weather if your have planned to bivouac. Prepare as much of the food as possible, e.g. chopping the vegetables or even making a pasta sauce, before you leave home. Let the children be involved in everything from marking the location on the map, to arranging the bivvy, through to helping with the cooking and washing up. Don’t patronise them and let them experiment. I love Wild Guide’Š’”’ŠDevon, Cornwall and the South West by Daniel Start, Tania Pascoe and Joe Keeling, published by Wild Things. This is my main source, along with my friends who share the same love of the outdoors. Bev, Ollie 17 and Jess 13. I must admit as a parent I absolutely love it when my son 17 year old Ollie and daughter 13 year old Jess want to come along on our Microadventures. It is a time where we can enjoy the outdoors together, have some fun and do something a bit different to the ordinary Friday nights staying in on the computers or watching TV. The first one we shared was in the mysterious Wistmans Woods on Dartmoor one Saturday in August 2015. Ollie has lots of experience wild camping and bivvying with cubs/scouts/explorers. He is always great to have on board as he know all the tricks to setting up a good spot where to camp, tarp ideas etc’¦We always seem to learn something new from him every time..just simple things like tying a tarp to a trees with a downward angle for the rain to fall off. He seems to enjoy sharing his knowledge and helping us oldies haha 😀 It was great bivvying in the woods although a bit wet that particular night. It was my daughter’™s first outing like this so she was a bit nervous with insects etc. (moths, spiders or anything with 6 legs or more 🙂 We usually carry the tent for Jess as it makes her feel a bit more secure. The next trip we did together was in the middle of a field overlooking Glastonbury Tor. It was April last year. The weather was warm. We found it tricky finding a great spot so went in the middle of a field . The farmer woke us up in the middle of night shining tractor lights on us in the adjacent field.. So that unnerved us a bit.. However my son slept soundly throughout on the opposite side of the big tree under his makeshift bivvy den . So far we have done three with my kids. Sara and Alex’Š’”’Š30s, civil servant, Perth Australia + two little boys ages 1 and 2. Both parents with full time jobs, two kids under the age of 3 (juggling nap times and a general lack of sleep), living in a city, new to the country so no friends or family for support and a general lack of experience! Our family has been inspired do a microadventure a week thanks to Microadventures. Whilst this had mostly turned out to be hiking in new places, we have also done new activities with the kids. We are just over half way so have a whole bunch to choose from. I think our favorite so far has been a visit to Tasmania. Ostentatiously we were there for a wedding but we also made time for some side trips, including up Mount Wellington for a visit to see snow (we live in Australia so that’™s hard to come by) and down to a national park to see a blow hole. Getting out of the door smoothly and on time is a magical start to an adventure with a toddler and a baby (and grandparents and aunties!). Seeing our two year old seeing snow for the first time and then mastering the art of throwing snow balls! The littlest is always pretty happy when he’™s warm and snuggly, being carried around. We nearly didn’™t get to the top of Mount Wellington as the weather earlier in the morning caused the wardens to shut the road. Whilst we were happy to take a trail on a lower part of the Mountain, it would have been better to do more research prior to be more familiar with which trails would have been better for the family as a whole (including the grandparents). We haven’™t done any yet with the kids but plan on starting easy’Š’”’Šdrive up camping at a place which has lots of trails to explore on different days. With such small kids, it lets us structure nap times and is gentle on the adults as we can take more creature comforts and carry less. Then we plan on progressing to walk up camping. Fun times ahead! Food food food! And layers. Waterproof jackets are also windproof so good for keeping warm. Mobile snacks are great for little people (and big people too) so we have a snack pot for each of the boys with double handles and a spill proof (ish) lid. Our eldest also has a his own hydration pack so he can carry his water (it gets pretty hot here in Perth) and a toy or two. He loves the autonomy it gives him. Clearly, for the non-walker there is an essential adventuring piece of gear’Š’”’Ša baby carrier. My favorite is a soft structured carrier, rather than a backpack style one. Our youngest has had many a good nap in it. Start really really small. Getting out of the door is literally the hardest part, especially babies and younger kids. Being part of a group can also help: I joined Hike it Baby so I would have moral support to get out of the house, willing hands to help me when I was out (two under two was no joke!) and some local knowledge where I was lacking. The Family Adventure Project have some great resources and have been blogging a long time so cover all the way from babies to early teens. For me, a microadventure is most fun if I can include my family. The biggest obstacle we face is finding a time when we are all free. Between us, our evenings and weekends regularly include karate, judo, football, running, cycling and Zumba! As the kids get older, keeping them enthusiastic about joining me outdoors can be challenging, although it’™s easy if the alternative is revision or homework! I used to want all the best kit and bought loads of stuff that I now rarely use. I now get satisfaction using cheap, borrowed, repurposed, recycled or second hand kit, or even stuff that I have found. On saying that, some high quality gear always finds its way into my backpack or pocket. The best thing for me was watching Ellie and Joel mucking around, especially when trying to sledge down a muddy slope. Just a few hours outdoors made my day feel worthwhile and I love to think that they learned something and had fun. I also received brownie points from a tired wife who deserved a morning of peace and quiet! We also managed to get rid of the tree! We’™d already learned from earlier outings, so this one went pretty well. Previously, we would try to plan exactly what we were going to do and would carry far too much kit. The kids used to get really upset if they thought we were going to do a certain activity, only to find it wasn’™t possible! One example was to build a shelter, only to find very few fallen branches. They got upset when I wouldn’™t let them tear down trees for their shelter. We now have a few ideas when we go out, but have learned to improvise and be creative when we arrive at our playground. I’m™ve camped out in my bivvy bag a couple of times, but have stuck to our back garden when ‘˜wild camping’™ with the kids. I’m™m always concerned about being found by irate landowners, so have yet to try this more often. Strong bin bags are top of my list, if only for sitting the kids in for the drive home! Also, they’™re handy for for sitting on (or in), make adequate ponchos or wind cheaters and are great for carrying muddy/wet clothes or soot/food covered cookware. I also always carry wet wipes and/or gel hand wash. Finally, I always carry a torch, even if just popping out for a couple of hours. More than once, we’™ve ended up staying outdoors all day and have plodded our way of the woods after sunset. I get my kids to pack their own bags. When they were younger, this involved stuffing bags with everything that they owned. Now they pack light(er). I still carry a couple of extra layers just in case. When the kids were little, I’m™d carry any blades, saws, fire lighters etc but now trust that they’™ve learned enough to use them safely. I also always stash away a few cake bars or chocolates to dangle in front of them if they need motivating to climb a hill, pack away a shelter, coil up ropes or trudge back to the car. Talking of cars, I usually keep spare clothes and trainers in the car as we rarely make it back clean!! Ellie and Joel were obsessed by Bear Grylls when the were little. Buying them anything in grey/orange with the BG logo was guaranteed to get them excited about kitting up and getting outdoors. Moving on, when they started watching ‘˜YouTubers’™, buying Ellie a camcorder to record her own video clips encouraged her to get out. Buying a rope for Joel was also extremely popular and he still loves setting it up to help him scramble up, down and across the slopes in the local woods. A certain ‘˜Microadventures’™ book also proved very popular..? We film a lot of our microadventures, but usually just share with family and sometimes on Facebook. I’m™ve stored a few example on Vimeo which I’m™m happy to share on request! Feel free to contact me at mjark@icloud.com. I am in the oil industry and my wife is full time mum. Both our boys are Autistic. What are the obstacles in our life that make having microadventures difficult? I work in the oil and gas industry and I’m™m away from home on a rotational basis, so there is 50% of the time gone before we start. Weather apart, we live in the Northeast of Scotland so trying to get autistic kids enthused about outside when it’™s cold, wet and windy can be a challenge. Also modern tech ‘¦competing with Ipads and TV and if your kids are autistic ‘¦minecraft!! Those in the know will understand. Tell us about your micro adventures with your kids. I have started small, not even leaving the garden yet but great results camping overnight went down very well. Having the frontier stove on, making hot chocolate and a cup of tea on the stove and allowing the kids supervised to feed the fire. On poor nights I have turned off the tv and we have a wood burning stove so I bought a cast iron pie iron for making toasted sandwiches on the fire ‘¦.all received very well. The next stage is to move it away from home for an overnight camp. My plan- little at a time. What was good about your microadventure ? The kids loved it , as did I! My wife got a few hours peace and quiet to watch masterchef and I was just glad to get them off of their Ipads. Fingers crossed nothing yet ‘¦ next time maybe plan it instead of just winging it and include my wife also. Not the best to advise on this as new to it with kids myself, never mind autistic kids’¦ Best advice is to keep it simple to start and keep it reasonably close to base or home so if it goes ‘œwrong’ it’™s no big deal to abort. Once experience builds then move it further afield. I have to admit to not reading your list! Seriously though, extra warm gear , blankets etc, spare pants and socks for ‘œaccidents’. If kids are medicated at all obviously their medication. Decent equipment tent sleeping bags etc, head torch , back up torch and spare batteries, small first aid kit’¦can get decent small ones that fit into a side pocket of a rucksack. Plenty of marshmallows for the kids and plenty of chocolate- to throw at the wife. If she starts growling, retreat to safe distance and lob it at her! Kelly kettle, a hammock- I’m™ve slept in the desert with work in my hammock and those were some of best nights sleep ever. A cast iron skillet- there is nothing like bacon and eggs outside off of a cast iron skillet. If you don’™t have a tent, that’™s the obvious one. Decent pair of walking boots with good ankle support. OH!!!! Fishing- take the kids fishing, my god they love it! So fishing gear, buy fishing gear! We’™re a family of 5, we live in Stirling, Scotland. Iain (44 yo) works as a mechanical engineer. I, Merlijn ( 39 yo). I am a plant ecologist, but currently I home educate our 3 boys: Paden (9 yo), Kester (7 yo) and Elyan (6yo). What makes microadventures difficult for me (Merlijn), is mainly the headspace and time to come up with a plan and organise it. However, usually it proves a lot simpler than you think- it doesn’™t need to be complicated. We’™ve been doing bicycle touring holidays since our oldest was 5 months old. We cycled the Great Glen Way hiking path when the boys were 2, 3 and 5 yo, which I would still describe as our most epic experience. Last year we travelled for 4 months on bikes through Europe (Scotland to Croatia) and we backpacked through Thailand for a month. Our last microadventure was at the start of this year, back in Scotland. In January we bivvied out with the kids for one night. We had just purchased bivvy bags, and 4 season sleeping bags for all of us, because we wanted to extend our camping experiences into winter season. The boys couldn’™t wait to try them out. Round about 7pm we set off from the house and walked into the woods. It can’™t have been more than 500 yards from the house, that we settled down under a starry sky for the night. Although we have camped and wild camped many times before, to sleep out under the starry night, was just an great new experience and challenge for the kids. It’™s so refreshing to feel the cold air on your face while cozy in your sleeping bag, and to see the trees and the infinite starry sky above you is just magical. The fact that we weren’™t far from the house was reassuring, just in case the sleeping bags didn’™t work as well as expected, or in case the heavens opened. In the middle of the night, Paden woke up, frozen. He had rolled off his thermarest. The temperature had dropped considerably, we reckon well below 0 C. His teeth with rattling with cold, he was upset, and wanted to go home. Fortunately, I had taken a thermo flask with hot water with me. I emptied a nalgene bottle, which had started to freeze, and made him a hot water bottle. That, some extra layers of clothing, a hat, and a careful tuck in, drawing the hood of the sleeping bag tight, luckily did the trick and we all slept soundly till well past dawn. We have wild camped a few times with the kids, always for one night only at the same spot. We look for places where you don’™t have to worry too much about the kids making a noise, because they will. If you have to worry about the noise level it takes away from the experience. Usually we choose spots well away from road/path. The other thing to keep in mind is: most people are nice. If you are spotted all you probably get is a friendly, encouraging nod, or even a chat. In general the presence of kids is disarming. We have invested in 1-L nalgene bottles for each of us, as they can double up as hot water bottles. When cycle touring it means we always have at least a litre each. A pee bottle (for boys) is also a good investment to save having to get up and out of bivvy bag/tent in the middle of the night. I have no personal experience with girls, but have heard of parents taking a 1-L empty yogurt pot/bucket with lid for girls. I fully agree on the kelly kettle. It’s good for day trips, or camping trips (if you can spare the space. We put one on the bike pannier rack of one of the kids, it made it look like a rocket propelled bike). Hot water in no time, for a hot cup of tea, coffee, or choco, and endless fun with making and feeding the fire. A flint & steel was another investment we made, initially as an experience for the kids, but it has actually proven very useful for lighting the kelly kettle (in combination with some cotton wool), and for lighting our camping stove (no more damp matches, or empty lighters), and the kids love it. Kids are pretty robust. As long as you make sure they are warm and dry, and fed and watered, kids can handle pretty much anything. Take a set of dry clothes (either for extra layers, or (more likely) for when they fall in the lake/stream/puddle that you had so specifically told them to stay out of), and make sure you have plenty of snacks/food. On warm and active days especially, make sure you have enough water supply, whether you bring it, or you know it’™s accessible from a tap or burn. Dehydrated kids make for grumpy, and seemingly naughty kids. Cover those basics and you are good to go. We have a facebook page: fivegoforth (https://www.facebook.com/fivewithbikes/). You are welcome to message us for a chat or an exchange of experiences. Jim and Kelly (mid 40s) with two boys ages 13 and 11. Our younger son has cerebral palsy with developmental delays. -We live in New Jersey, the most densely-populated state in the US. It is easy to get a daily dose of the outdoors at our beautiful, local parks but there is very limited camping/overnight opportunity in our immediate area so travel -often for at least an hour or so via car- is a must. The population density makes wild camping very tricky as your are almost always right in someone’s backyard. Image the scenario: Tony Soprano walks out and finds you in a bivvy sack in his yard. So, yeah, not a lot of wild camping. – Our younger son has a very hard time walking/standing for extended periods and can get very frustrated and irritable. There is a certain amount of additional friction and difficulty in spontaneously getting out to do things when you have a child with special needs. The spontaneous nature of the trip was the high point. It was amazingly refreshing and confidence-building to know that despite the challenges we face as a family we could just hop in the car and go somewhere to have a good time. Often times we really over-plan our trips and that can lead us to falsely believe that planning is a requirement of a good trip. This trip proved that you don’t always need a ton of planning to have a great time. Also, on this trip, we travelled some especially beautiful scenic roads through Eastern Shore Maryland. Instead of using GPS for directions we just followed the scenic route markers. For starters, our youngest son threw his iPad in the campfire (see above re developmental delays). At one point, the scenic route took us through the heart of chicken-raising country and it smelled horrible. Also, we ended up camping pretty close to the water which had a steep drop-off, this required that we maintain a really high-level of vigilance to make sure our younger son didn’t take off for the water’s edge unattended. -Otterbox for kids’™ iPads/iPhones. I know that some parents will freak out at the idea of bringing devices on a camping trip. The truth is that our kids don’t really use them all that much but when we get stuck in traffic or dinner is taking too long to prepare and the kids are getting cranky the devices can really help keep the peace as long as your kids are able to relinquish them when requested. The Otterbox cases are amazing and even saved one when it was tossed into the campfire for a few seconds. Look, people see our family and can almost immediately tell that things are more challenging for us than they are for a family with typically-developing kids. It’s difficult to even get our youngest kid in the car sometimes as he often needs to be lifted (and he’s a big kid!). But we will not let this stand in our way. We love one another and while we scream and yell and get frustrated (a lot) we enjoy spending time outdoors together as a family. If our family can do it, I guarantee you that your family can do it. All of our best memories as a family have taken place on our trips together. My name is Richard, I’mm married (to Y) and we have a two year old daughter who I’mll call W. I’mm late to fatherhood, already 44. We live and work in Beijing. Before W came along, I had visions of being the ‘œAdventure Dad’, inspired by an American guy I saw on youtube who took his one year old camping in the Rockies (gutsy’Š’”’Šhe had to sling their food in a tree because of bears). But between smog, -10C winter nights, bad weather, more smog, and the world’™s deadliest disease vector’Š’”’Šother people’s kids!’Š’”’Šit turned out the hardest thing about being Adventure Dad wasn’t the adventure, but getting out of the house. The logistics I can handle, even in a megacity like Beijing. Having the stars align is the hard part: a clear air and nice weather weekend that’™s warm enough but not too hot to take a little child into the hills, when everyone is over the latest cold from nursery, and there are no unbreakable commitments. I took W on a ‘œDaddy-Daughter Camping Trip’ on the Great Wall. We hiked a couple of hours into the mountains up to a ‘œwild wall’ section in the mountains west of Beijing. We camped high up above the pass, near a wonderful old watch tower. We played on the wall, took a pretty sleepless night in our tent, and then the sun woke us early for breakfast. More play, with stones, grass, flower buds, and then W had a nice long deep sleep on the ride back into the city. Hard to answer without sounding like a cliche, but it was great to spend the time with my kid. It was great to see her exploring a new and natural environment and great for me because I’md first conceived this trip before she was born. I was sceptical of imminent fatherhood’s impact on my active outdoor life, and another Dad’s video on youtube inspired me to realise that kids didn’t mean an end to that, just a new dimension of it. From the moment I saw that, I wanted to do it with my kid. I had to cancel this first trip many times, so it was very satisfying to finally do it; even just to know that I could. I was pretty lucky. Nothing really went wrong. I’md take a story book next time, she likes to ‘œread’ a book to fall asleep and its absence meant sleep’Š’”’Šoh, desperately needed sleep!’Š’”’Štook quite a while longer to arrive. I have two simple pieces of advice. One: Dawn breaks on even the longest nights. Two: Take coffee. My specific advice, with a two year old at least, is to use a tent. Bivvies can wait a little bit’Š’”’Šat least if you’re camping in the mountains. My kid hates blankets, so she’s not going to go into a bivvy bag anyway, and for kids that small it’s probably still a suffocation risk. But more importantly, if you are exhausted from everything’Š’”’Šand you will be’Š’”’Šyou don’t want further worries that she’ll get up and walk away (potentially into a ditch or off a cliff) while you’re comatose at 3am. Also, take a small shovel or trowel. When the time comes, dig a decent hole, and tip the contents of your kid’s nappy into it (just as you’d do for your own ‘œwild dump’). But take the nappy back home for thoughtful disposal elsewhere. Remember to bring some suitable plastic bags for that purpose! I thought about this quite a bit before my trip. With a two year old, you either limit your journey to the distance she can walk, or accept that you need to carry her for much of the way. If the latter, then I think it’s worth investing in a good baby carrier; the most comfortable and well-designed you can manage. When she was smaller I used a BabyBjorn type carrier, with her on front, but soon enough she was too big and dangled inconveniently between my thighs, making it hard to hike. So now I use a backpack carrier (I chose the Osprey Poco and have been very happy with it). For overnight hiking, I discovered that the volume the kid takes means there’s not nearly enough room for even the most minimalist setup. I decided I needed a tent, a sleeping bag, and of course food and water. So I got an Army disposal ‘œchest rig’ and some pouches, and transferred some of the load to the front. This works pretty well and is more comfortable than wearing a day pack on my front. On Amazon these things are relatively inexpensive if you shop around a bit (the vest part was about $35 and the various pouches were $10’Š’”’Š$15. The bulky stuff goes in, or outside, the baby carrier, and a lot of the smaller stuff goes in the chest rig. Lightweight coffee plunger, a pot to boil water, and a small gas stove (like MSR PocketRocket). Grind some nice coffee before you go. Teaching your kid about the miracle of fire then has an incredible side benefit of helping you stay awake for the second day of the trip! The hardest part is getting out of the house, it really is. Push yourself to do that, and the rest is not so hard. Lolling about in a field chasing butterflies is far easier, and far more fun, than lugging all the gear down to the train station. Consider that the real challenge, and the whole thing takes on a new perspective. Once you’re out the door, and on the road, you’re already into the easiest part, and the most fun. Especially if your kids are little, the pure novelty of it will keep them excited until they are so tired they pass out. Keep your spirits up because your kids will follow your lead. Set the example: pick up the twig; analyse the flower bud; marvel at the view. They’ll get the drift pretty quickly. Don’t panic. If something goes wrong, remember, it’s an adventure. Embrace it. It probably wouldn’t be one if everything went exactly as planned. The other thing is pack ahead, even a few days ahead. It always, always takes longer than you think, and if you’re rushing on Saturday morning you’ll end up forgetting something, or leaving the house even more stressed out than you need to be. Once you’ve done it once, keep the gear more-or-less packed. That makes it easier to go a second time, and a third. Kerry-Anne Martin (38), stay at home parent and home educator and Finn (6). We live in rural southern Scotland (South Lanarkshire). The biggest obstacles for me personally are the perceived (and actual) organisation and effort required to take children out on a microadventure, a lack of previous experience and a general fear of trying something new. I’mve not found low income to be a particular challenge. Our family of three lives from one below average income but I’mve found that microadventures are a great way to have many memorable experiences without spending a lot of money (aside from the initial outlay needed for some basic kit to start with, which can be accrued over time). Microadventures are so much cheaper than an average family ‘˜day out’. You don’t actually need to spend anything! Last summer I took my then 5 year old son on our first mother and son bivvy adventure to Loch Enoch in Galloway Forest Park. We took over five hours to walk the 5’“6 miles to the Loch from the nearest road end over a lot of pathless bog. We arrived as the sun was setting so hastily made a quick dinner and set up our ‘˜beds’™ for the night. We watched the stars in the evening, listened to the night time wildlife and spent the following morning paddling in the loch and enjoying the sunshine. We didn’t see another soul. Nothing much happened but it was perfect. My son still talks favourably about it now, even earlier today he was talking about how it was his favourite bivvy to date. Seeing the joy on my son’s face as we reached our destination for the night, a beautiful and serene tiny white sandy beach on the shore of the loch, 500m above sea level. Due to my inaccurate estimation of how long it would take us to reach, the sun was already beginning to go down but I stopped camp preparations to appreciate the moment as my son pranced up and down the small stretch of sand singing ‘˜I love today, I love today, today is the best day of my life’™. It was one of those really special parenting moments that you treasure forever. It took a lot longer than I imagined! From the map it looked like there was a path but it soon became obvious that there was no such thing. I suppose it would have been sensible to have scouted out the walk in the first place but the uncertainty and extra effort certainly added to the adventure, although I would have felt less rushed if I’m™d allowed more time. In fact the pathless nature of the walk appealed to my son a lot more than a well made path or track. It took me several hours to get to sleep; it felt a lot more vulnerable sleeping directly under the stars and I found myself sitting up to investigate very time I heard a noise (which was pretty often) and to check on my son (that he was warm enough, hadn’t burrowed to deep into his bag etc), yet being awake so often I got to witness the passage of the moon and stars across the night sky. Every microadventure experience is different and although there were challenges, I wouldn’t do things drastically differently the next time. We are lucky to live in Scotland where wild camping is legal in most places so I don’t feel I have to worry as much about being where I shouldn’t be and there’s plenty of open space. The problem with kids is that they are not as discrete as adults and it takes a lot longer to make and break camp. If your worries are more concerned about how your kids will get on, you can only try it and see. So my advice would be to start with somewhere you feel safe, maybe a friend or relative’s garden or somewhere away from civilisation where you’™re unlikely to be bothered by people. Search online or ask on forums for good places to wild camp and take a friend for moral support. What packing advice would you give beyond my usual microadventure kit list information? Extra kit you might need with kids will vary according to the childs age(s) but I’mve not found I’mve needed any extra kit above and beyond the usual. That said I have found it a challenge finding child sized technical outdoor gear, anything from warm, lightweight sleeping bags, hiking shoes, child sized backpacks to thermal clothing. With regards to the sleeping bag I just use my husbands tied off half way with a piece of rope to stop him burrowing down and getting stuck. I would say to always pack an extra set of clothes for the kids though. Sometimes we don’t need them but kids do have a tendency of getting wet and muddy. And plenty of food including morale-boosting snacks. You absolutely do not want to run out of food. And wet wipes. And a small first aid kit. I’mve also invested in a water bottle with an integral filter/purifier, which means I don’t need to worry about water quality and the little one picking up anything. We’ve had great fun with our kelly kettle, especially on winter picnics. Other kit I would suggest would be a headtorch (for night walks, camping in general and messaging in morse code), a flint and steel for fire lighting, a small knife (we have a Morakniv specially designed for young people with a blunt end and finger guard. My son uses it under supervision to sharpen sticks for roasting marshmallows and sausages). A compass. A hammock (we’ve not slept in one yet but they are fun to play in). A rope and a tarp to make dens and shelters and all sorts of games. But really the most durable, long-lasting and imagination inspiring things are the sticks he picks up and plays with wherever he goes, available for free! Phone a friend! I certainly derived a feeling of achievement from doing it alone with my son, but I’mve found microadventures to be a lot easier with company. For our ‘˜Year of Microadventures’™ this year we’ve managed to persuade another mother and son to join us on several of our monthly bivvys and it’s been a lot easier to commit to regular microadventures and share the load (and it diminishes my night time fears!) Secondly, start small, whether in the garden or close to home. Then it’s not a problem if you forget something critical or your kids aren’t enjoying themselves. Based on the experience of our first couple of microadventures I wrote a list of everything we need and keep it somewhere safe which cuts down on the organisational elements of going on a microadventure (which was a barrier for me) and allows our adventures to be more impromptu. Have you seen the National Trust’s 50 things to do before you’re 11 3/4?